Gently cleanse away impurities and toxins while nourishing your scalp & roots with the richest, clinically proven ingredients for hair loss and hair growth. Healthier, fuller results begin with just one application. Let the regeneration begin®. An intensive, restorative formula recommended by physicians for hair loss, RegenePure® DR Hair & Scalp Treatment helps repair hair from the roots and provides the ultimate skin treatment for the scalp. Ketoconazole in Regenepure DR, cleanse the hair and scalp and make hair look and feel thicker. Gently cleanse away impurities and buildup while nourishing your scalp & roots with the richest, powerful anti hair loss & hair growth ingredients. Healthier, fuller results begin with just one application. Let the regeneration begin®. An intensive, restorative formula recommended by physicians, RegenePure® DR Hair & Scalp Treatment helps repairs hair from the roots and provides the ultimate skin care for the scalp. 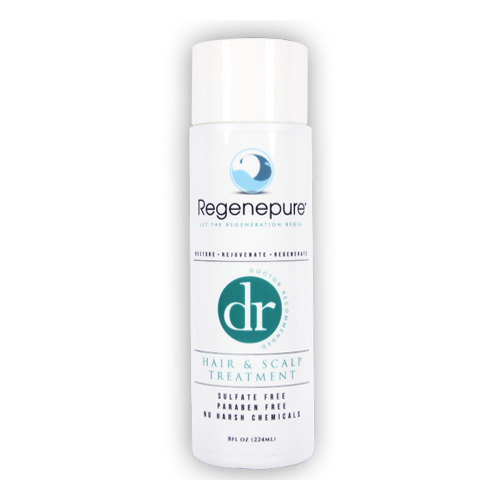 RegenePure® DR contains powerful ingredients which help oppose hair fall, flakes and makes the hair look and feel thicker. It contains Ketoconazole to cleanse the hair and scalp and make hair look and feel thicker. RegenePure® DR is packed with beneficial elements, including Saw Palmetto extract, Vitamin B6 and Zinc Oxide. Niacin, Caffeine and Linolenic Acid. Also included to stimulate the scalp, while Emu and Jojoba oils keep the skin supple and rejuvenated. We believe your hair deserves the best and that’s why our shampoos are formulated with world-class ingredients and powerful restorative properties.